Aseem Chhabra reports from the Toronto International Film Festival 2018. 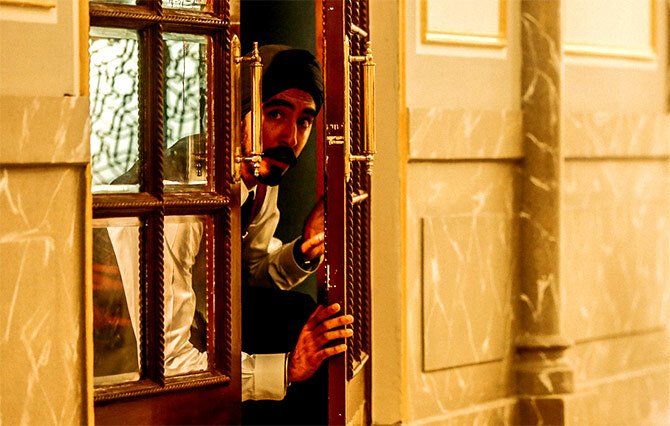 IMAGE: Dev Patel in Hotel Mumbai. The 26/11 Mumbai terror attack is story too close to home, yet it needs to be told. The world needs to know what the city, its citizens -- especially the victims and the heroes -- experienced for the days and nights that followed. There have been at least two fictionalised attempts to narrate the story, Taj Mahal (2015), a weak French production, and Ram Gopal Varma's loud The Attacks of 26/11 (2013). Both films did not do justice to the story. But now a new film Hotel Mumbai, directed by Australian film-maker Anthony Maras, recreates the horrors of the first night of the attacks. Starring Armie Hammer, Dev Patel and a very effective Anupam Kher, Hotel Mumbai premiered at the Toronto International Film Festival. The film is a harrowing account -- part fictionalised -- of the attack on the Taj Mahal Hotel by four Pakistan-trained terrorists. As a thriller, Hotel Mumbai works well. But there is one major problem with Maras's big budget film. It fails to mention that the terrorists came to India from Pakistan. I raised the issue on Twitter after watching the film and one of the film's producers, Gaurav Mishra, who responded said that the film was made from the perspective of the guests at the Taj hotel, who did not know the terrorists were from Pakistan. There are a few problems with this statement -- for one, the terrorist and their handlers spoke in Punjabi, and not Urdu. In any case, as every reader will know, Urdu and Punjabi are commonly spoken in India as well. But more importantly, all Western viewers will watch the film with English subtitles and they cannot certainly tell if the terrorists were Pakistanis. The film-maker chose not to mention Pakistan, even in the end, where there could have been a card that stated the origin of the terrorists. So despite its noble attempts, tight editing, terrific sound design, good performances by Hammer, Patel and Kher, and a compelling story, Hotel Mumbai tells a big lie. 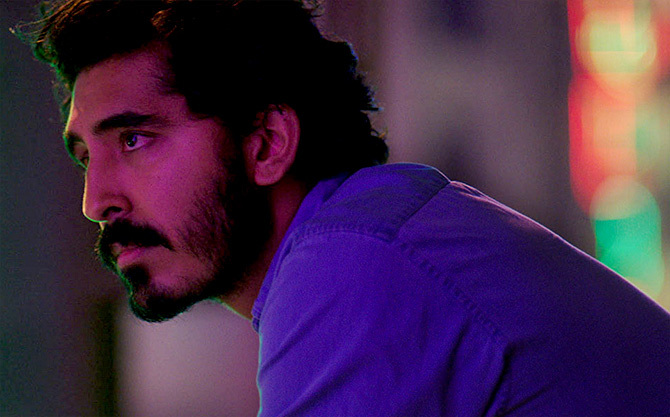 IMAGE: Dev Patel in The Wedding Guest. Hotel Mumbai is one of many Indian and India-themed films playing this year at TIFF. Dev Patel also stars in Michael Winterbottom's The Wedding Guest, a thriller set in Pakistan and India. Patel plays a mysterious man sent to kidnap a British girl (Radhika Apte, with an uneven British accent) about to get married in Pakistan. Patel carries the film on his shoulders in one of his strongest performances. The film's main characters travel from Lahore to Amritsar, Delhi, Jaipur and finally Goa. But somewhere along the way, Winterbottom's film -- the director usually works with no script -- starts to fall apart. By the end, The Wedding Guest feels like a flat, dull thriller that should have worked. IMAGE: Vicky Kaushal and Taapsee Pannu in Manmarziyaan. Wedding and Amritsar is a big part of Anurag Kashyap's Marmarziyaan, the happiest film the director has made in his entire career. The film's English title Husband Material is perhaps more apt, since much of the focus is on who the film's female protagonist Rumi (Taapsee Pannu at her best) should marry -- the boisterous DJ Vicky (Vicky Kaushal) or the pensive, quieter London-returned Robbie (Abhishek Bachchan). Clearly her heart says Vicky, but is he the right husband material? Marmarziyaan makes a slight nod to Sanjay Leela Bhansali's Hum Dil De Chuke Sanam, but it has its own internal energy that follows the Punjabi, small-town ethos of Amritsar with a lot of humour and several supporting actors. At 150 minutes, Marmarziyaan feels a tad bit too long and repetitive towards the last half hour. A stronger screenplay should have allowed the audience to read the minds of the characters, but Marmarziyaan feels the need to emphasise and underline every emotion with yet another song. But Kaushal and Pannu keep the film alive and Marmarziyaan is essentially a lot of fun. IMAGE: A scene from The Man Who Feels No Pain. 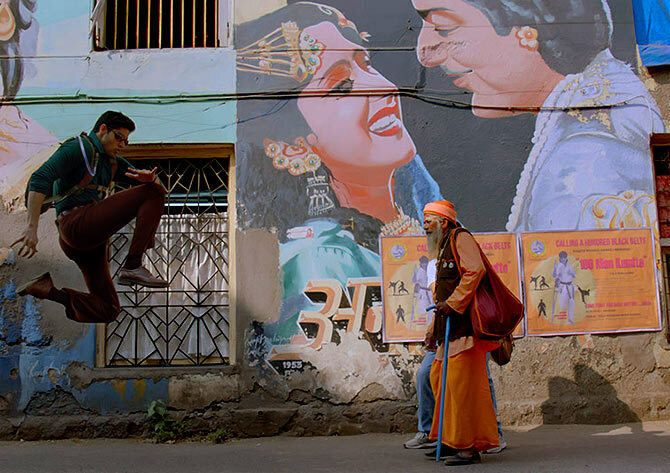 Anurag Kashyap's regular co-writer and assistant Vasan Bala is at TIFF with his second directorial venture, The Man Who Feels No Pain (Mard Ko Dard Nahin Hota), a quirky, often hilarious take on martial arts films, with references to pop culture and old Bollywood. Bala's first film ,strong>Peddlers played at TIFF in 2012. With a charming lead pair, Abhimanyu Dassani, son of former Bollywood star Bhagyashree (Maine Pyar Kiya), and Radhika Madan (who will soon be seen in Vishal Bhardwaj's Pataakha), plus Gulshan Devaiah playing a double role of a one-legged karate master and his psychotic twin, The Man Who Feels No Pain is a blast. A thoroughly enjoyable film. Ten years after she directed her first film Firaaq, which had its world premiere at TIFF, Nandita Das is back with her second film Manto, an exploration of the life, work and times of Saadat Hasan Manto from 1946 until his death in 1955. 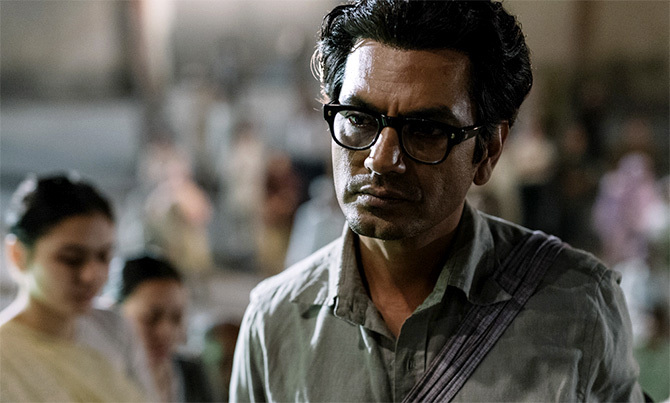 Manto gives Nawazuddin Siddiqui a rare chance to explore his acting muscles beyond the dark, violent roles he often plays. The film also boasts of a terrific ensemble cast -- many who appear in cameos -- including Rasika Dugal, Rajshri Deshpande, Shashank Arora, Rishi Kapoor, Vijay Verma, Ila Arun, Ranbir Shorey, Divya Dutta, Neeraj Kabi, Gurdas Maan, Tillotama Shome, Danish Husain, Paresh Rawal and the biggest surprise of all: Javed Akhtar. The huge cast speaks volumes of Nandita Das' ability to draw talent. Manto is an important film as it reflects on the pointlessness of divisions in society on religious grounds and the harsh existence of the marginalised. It speaks with a certain urgency that is essential for our times. IMAGE: A scene from Bulbul Can Sing. Assamese film-maker Rima Das is back at TIFF for the second time in two years; her National Award-winning Village Rockstars was screened in 2017. Her new film Bulbul Can Sing is another lovely take on life in rural Assam, using quiet, sparse dialogues and a cinematic language that Das is becoming known for. IMAGE: A scene from The Sweet Requiem. But the most moving film from India at TIFF is Ritu Sarin and Tenzing Sonam's The Sweet Requiem, a heartbreaking tale of exile, dislocation and memories of a homeland far away. The film focuses on the Tibetan refugee community living in tough conditions in North Delhi from where phone calls placed to family members left behind in China are rarely connected and young exiles go about their daily lives with a heavy dose of pain in their hearts. 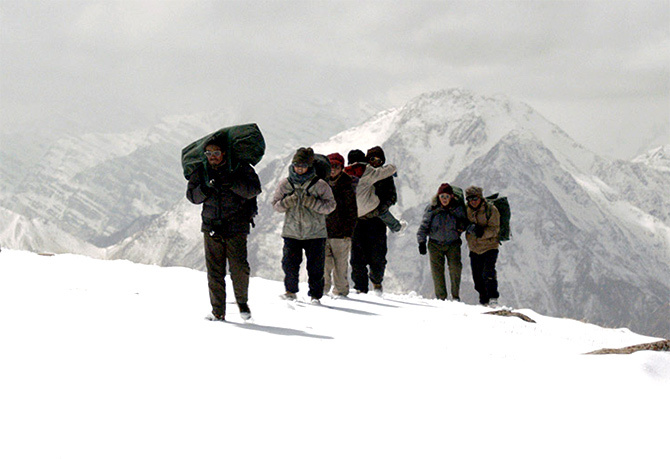 The flashback sequences in The Sweet Requiem take the viewers to breathtaking snowcapped mountains where a caravan of Tibetans is trying to escape into India, desperately avoiding Chinese border patrols. But life in India is also packed with hurdles, with Chinese spies showing up at odd moments, and routine disturbing news items about Tibetans committing self-immolation. We often see exiled Tibetans in Delhi, Dharmsala and even New York City. But with The Sweet Requiem, we can only begin to understand the tragedies that lie behind their calm faces.